First comes asparagus, then garlic scapes, then green peas, and then you know that summer has really, truly arrived. For me, the challenge with fresh peas is to not eat too many while shucking; there tends to be a bit of a ‘one for me, one for the pot’ approach that often makes it difficult to gather enough for the recipe. This spread is a wonderful way to highlight fresh peas when they’re at their peak in June and July. The almond butter adds a little bulk and a nice nutty hint, and then mint brightens everything up. If you’re not up for shucking, frozen peas will do, but I promise it’s worth the work to use fresh! Bring water to a boil in small pot. Add peas. The cooking time will depend on whether you’re using fresh or frozen. 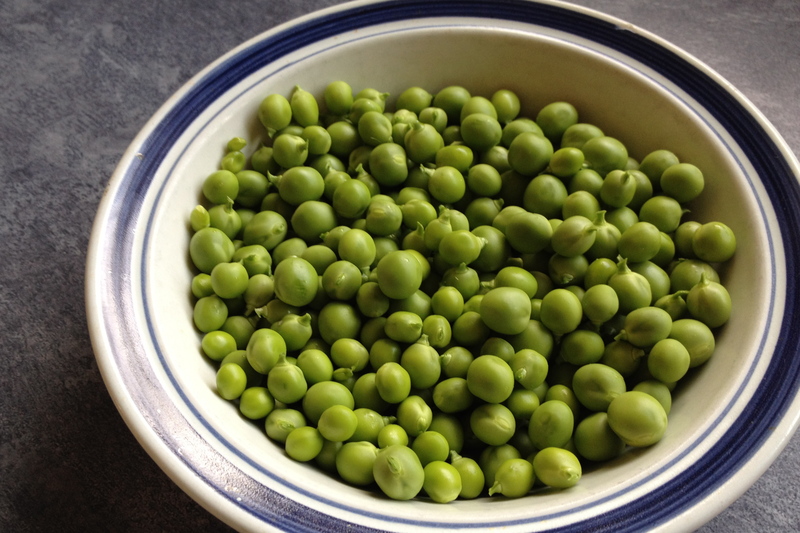 Peas should be fully cooked, but not overcooked or they will go mushy. When ready, drain peas and allow to cool to room temperature. Add peas, a handful of mint leaves, almond butter, and garlic to food processor. Start with a small amount of mint and then adjust as you go. You can always add more, so best not to overdo it in the beginning. Process until you have a smooth paste. It should be fairly thick, but soft enough to spread. Adjust consistency with a little water if too dry. Add cayenne pepper, black pepper, more mint leaves and salt to taste. Serve with crispy multigrain crackers or fresh baguette. 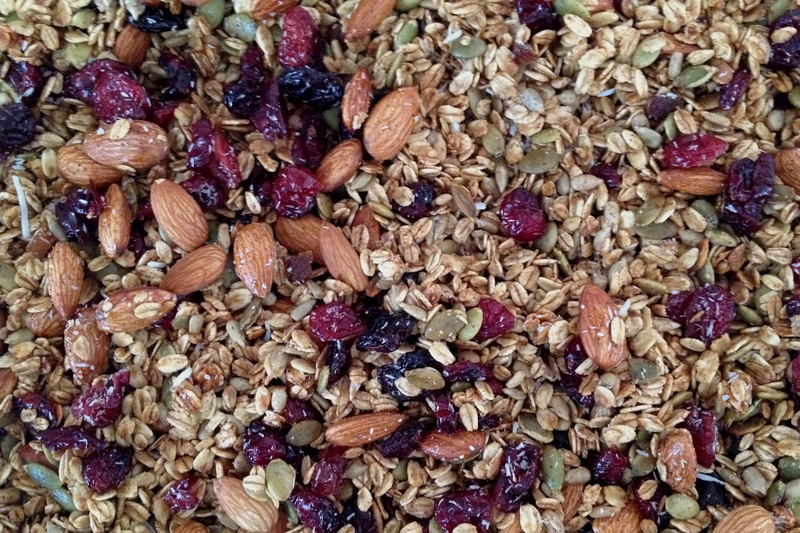 This spread can be made a day ahead and stored in the fridge in an airtight container. It should keep for 2-3 days. I have memories from my early double-digit days, when I was no longer a kid but also not yet officially a teen, of watching The Wonderful World of Disney on a Sunday night while enjoying warm apple crisp. Truth be told, I am not sure if this exact scenario only happened once, or if there were many Sundays like this. Either way, the apple crisp memory lingers, and whenever I enjoy soft cinnamon-scented apples with a toasted crispy oat topping, I am taken back to that Sunday night. 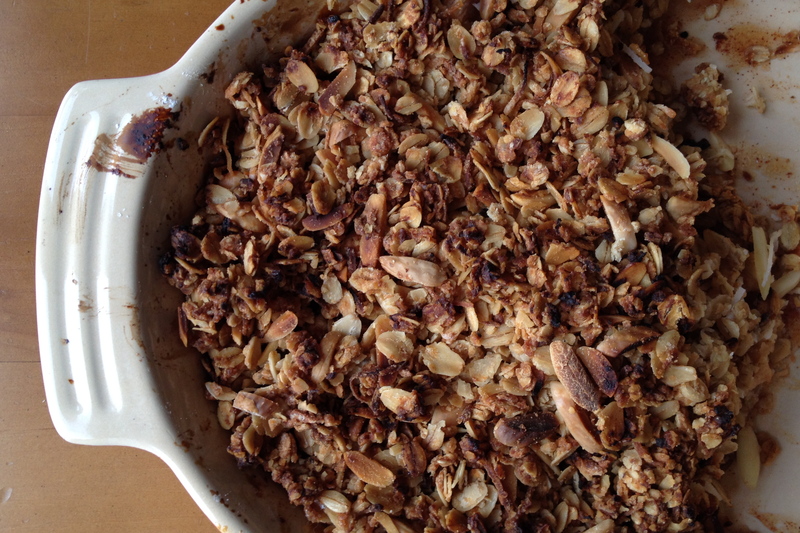 On a recent visit to see some friends in the Laurentians region of Quebec, there was a request for apple crisp. It was a Monday night, but that didn’t seem like a reason to hold back. My girlfriend suggested a recipe from Smitten Kitchen, which turned out to be an absolutely delicious recommendation. And much like the original recipe suggests, we did enjoy it for breakfast as much as for dessert! I made a couple of modifications to accommodate a dairy-free diner, and to take advantage of the stash of Quebec maple syrup that our hosts had in the house. So, as a result, this version is vegan-friendly. But you could always use butter instead of Earth Balance, and use honey instead of maple syrup (as the Smitten Kitchen recipe does). In a baking dish, mix apple pieces with sugar, cornstarch, cinnamon and pinch of salt. Sprinkle with lemon juice and toss to coat. I find it easiest to just get in there with my hands to mix it all around. In a small saucepan, melt the Earth Balance with the maple syrup. Stir in the flour and oats until the liquid is absorbed and it starts to hold together. Add the almonds and coconut and give it another good stir. Spread over the apples, covering the entire top of the baking dish. Bake at 400F for 45 to 55 minutes. The apples should be tender when pierced with a fork and you should see bubbles around the edge of the dish. If the crumble top begins to get too brown, cover with tin foil. A few minutes before you are ready to serve, remove the foil to allow top to crisp up. Serve straight up, or with a scoop of your favourite dairy or non-dairy treat – whip cream, vanilla ice cream, coconut soy frozen dessert. Cool leftovers (if there are any) to room temperature and then store in the fridge for breakfast the next morning. My grandmother used to make a version of these breakfast puffs. Hers were full size muffins, and she would roll the whole thing in melted butter and then in cinnamon sugar. My mom recalls enjoying them while they were still warm from the oven. I have made a few batches following the original recipe, but I have also tinkered with it a bit. I don’t often bake with shortening, so my version uses butter. And where the original calls for milk, I have adjusted to use sour cream. I am sharing both versions, so you can try either. 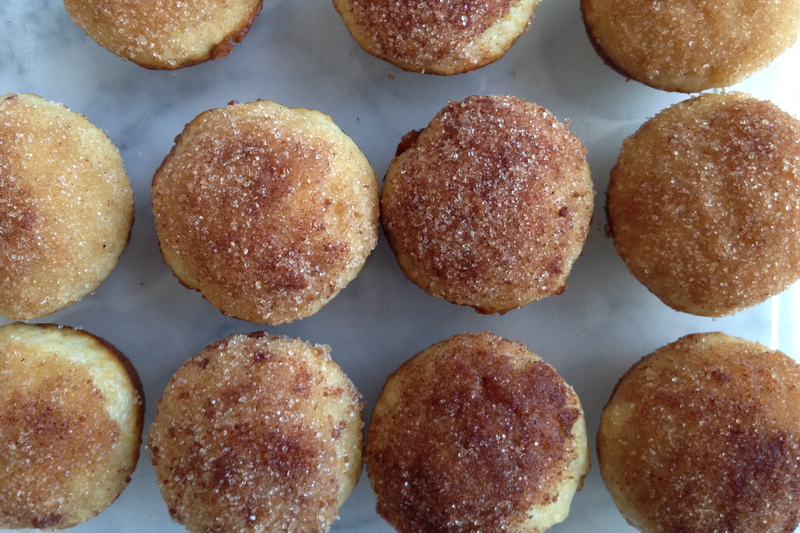 Whichever you prefer, these little muffins posing as donuts make for great homemade Timbits. They are fun to serve up if you have a crowd for breakfast, or make for a nice afternoon treat with a cup of tea. In a small bowl, combine flours, baking powder, baking soda, nutmeg and salt. Set aside. In a separate medium-sized bowl, cream butter and sugar using an electric mixer. Add egg and beat just until incorporated. Mix flour and sour cream into creamed butter mixture, alternating a bit of each until all ingredients are combined into a firm batter. Spoon into a greased mini muffin tin, filling each cup about 3/4 full. Bake for 16-18 minutes. While muffins are baking, melt butter. In a separate bowl combine sugar and cinnamon. Mix until well blended. When muffins are done, remove from muffin tin and transfer to a wire rack. Dip the top of each muffin into melted butter and then coat with the cinnamon sugar mixture. Here is the original recipe for those who want to give it a go. You can follow the same steps as my version above. I’ve tried baking the original version at 350F and 400F and I like the results at 400F for 15-17 minutes. The posset, while a very old dish going all the way back to medieval times, is very new to me. 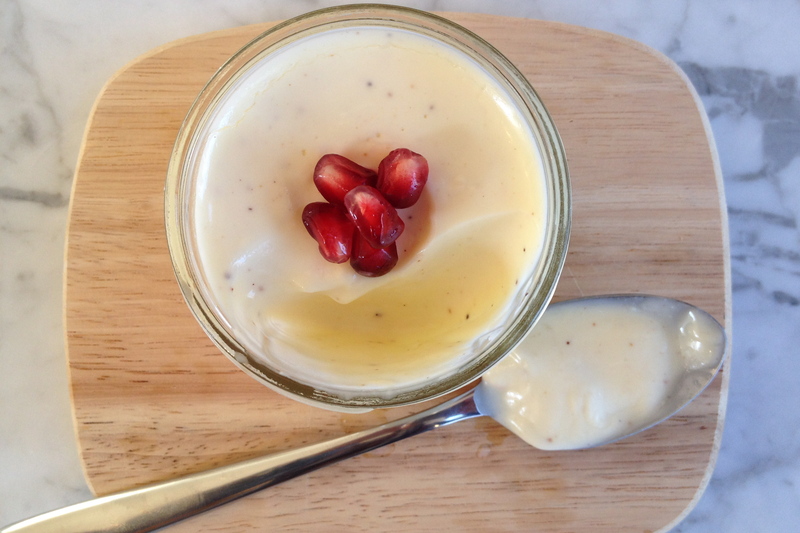 I learned about this creamy pudding while at the Ballymaloe Cookery School last August. The silky smooth texture is somewhere between a custard and a milky drink; it is surprisingly light and airy, even though you don’t whip the cream at all. There are variations on the recipe, some incorporating egg yolks, and others that use wine or ale to curdle the cream. The way I like to make a posset is incredibly simple and quick to put together, which makes it a great dessert for last-minute dinner parties. You only need a few spoonfuls to be quite satisfied, so have fun with small serving dishes – shot glasses, small glass jars, sake cups, little pots or ramekins. I am using lemon to curdle the cream, and have added a sprinkle of nutmeg for a slightly warming, autumnal flavour. At Ballymaloe, we steeped sweet geranium leaves in the cream and then strained them out. I think you could achieve a similar effect by adding a dash of St Germain elderflower liqueur. Next time I make possets I am thinking of incorporating nutmeg, ginger and a couple of cardamom pods…a sort of lemon chai posset. Will let you know how that turns out! Combine cream and sugar in a small saucepan. Add dash of nutmeg if including. Bring to a simmer. Then turn the heat down to low and stir frequently for 5 minutes. Remove from heat. Stir in the lemon juice. Pour into serving dishes. Allow to cool. Transfer to fridge to chill for at least 2 hours. The posset will set into a soft pudding. When I discovered Raincoast Crisps a few years ago, they really rocked my cracker world. With all the various fruit and nut combinations, they were so much more interesting than a basic biscuit. When a friend (well, actually a friend’s mom’s friend…try saying that 10 times fast!) told me she had a recipe for a homemade version, I was very excited to give it a go. Turns out they’re not really crackers, but more like double-baked biscotti – first you bake a loaf, then you slice and bake again. I have tweaked the original recipe over the years and ultimately find the one below works quite well. 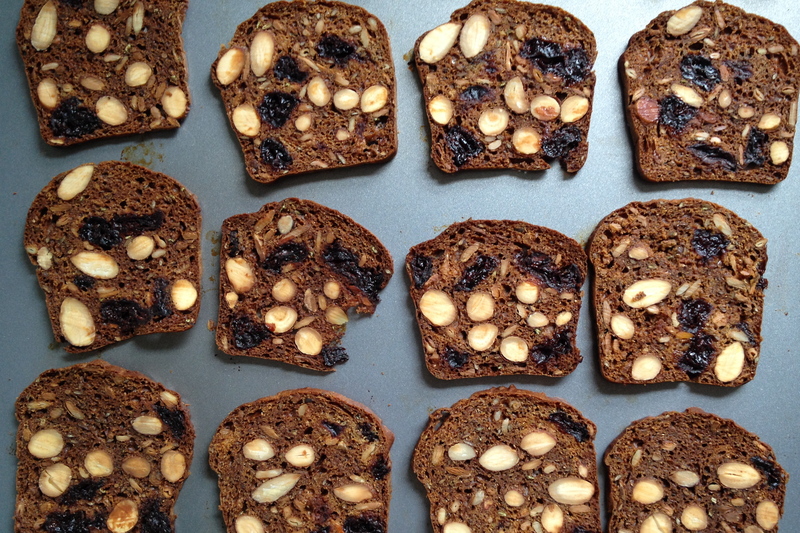 This recipe gives you three small loaves, so you can choose to do three different flavour combinations with your choice of fruit, nuts and seeds. Combine flours, baking soda, salt, brown sugar, ground flax seeds and rosemary in a medium-size mixing bowl. Set aside. In a separate bowl, combine buttermilk and honey. Stir until blended. Add the wet ingredients to the dry and stir gently until dough comes together. Add your choice of flavourings. Grease three small loaf pans (or line with parchment paper). I use three 5.75″x3″ pans (14.6cmx7.62cm). Bake at 350F for 22-25 minutes. Check if the loaves are done by inserting a toothpick into the centre – it should come out clean. Remove from oven and transfer cooked loaves to a cooling rack. I find the loaves easier to slice when they are really cool, so you can pop into the fridge, or even the freezer, for a few minutes before cutting into individual crackers. Place slices onto a baking sheet. Reduce oven temperature to 300F. Bake for 15 minutes, then flip crackers and return to oven for another 10-12 minutes. Alternatively, I bake the loaves, cut them in half, and freeze them. Then I bake up the crackers in small batches when I am ready to serve. To cook from frozen, remove from freezer and allow to defrost for about 30 minutes. Slice into crackers. Spread slices out on a baking sheets. Bake for 15 minutes, then flip crackers and return to oven for another 10-12 minutes. Serve with your favourite cheeses and spreads, or enjoy them straight up. 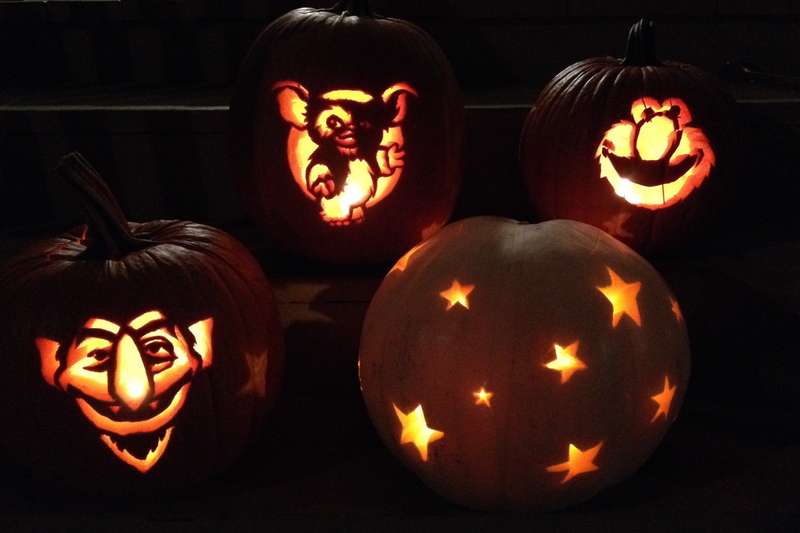 For the past five years, we have had a standing pumpkin carving soirée with a couple of friends. It’s an evening full of creativity, friendly competition, and much discussion of carving tools and techniques. While my favourite part of the night is seeing our creations lit up for the first time, running a close second is the sound of pumpkin seeds popping in the oven as they toast up for a midnight snack. All the scraping, spooning, and clearing of pumpkin goop is well worth it. This year I added a dash of smoked paprika and a very light dusting of cayenne pepper. You can’t go wrong with the classic olive oil and sea salt combo, but the paprika adds some nice colour while the cayenne gives that little hit of heat. Preheat oven to 300F. Line a baking sheet with parchment paper. 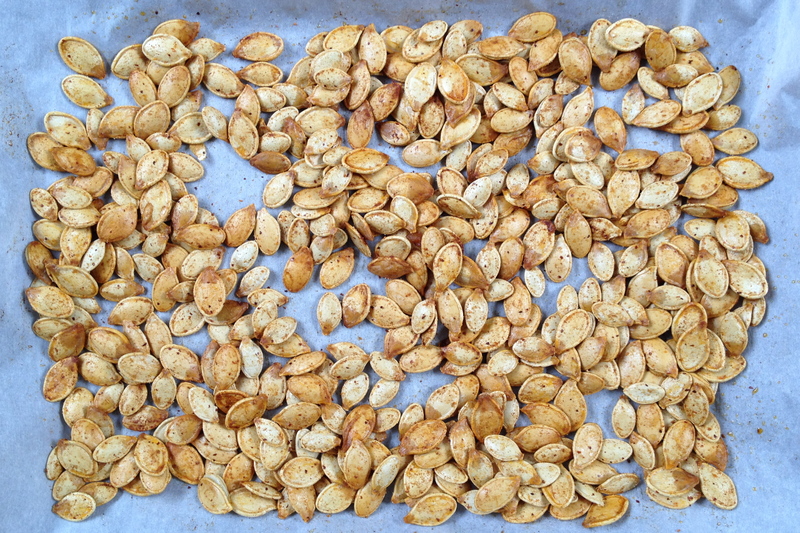 Thoroughly wash and dry the pumpkin seeds. Spread out on the baking sheet. Drizzle with olive oil and sea salt, as well as any other seasonings of your choice. Mix to coat. Toast for 15 minutes. Stir. Toast for another 10-15 minutes. Check to see if the seeds are as crunchy as you would like. If not, put back in the oven for another 5 minutes of so until the seeds are fully dry and have a nice crisp bite. Store in an airtight container or bag for a few days (if they make it that long…they disappear pretty quickly in our household).